This scarf began as a swatch, and just kept growing. I love the way the lace pattern is tiny, simple, and geometrical, yet very textural. It is a perfect first project for getting comfortable with lace knitting motions, as well as with lace-weight yarn. The lace weight merino wool is very stretchy, and relatively thick [for a laceweight! ], making it easy and forgiving to knit – perfect for a first lace project. Plus at $2.50, the project is unbelievably cheap! GAUGE: Gauge is not really important in this case, just start knitting the scarf and see if you like the effect. NEEDLES: I used a US#2 circular needle, but swatch and you will see what you like, but note that smaller needles create more contrast between the ‘solid’ parts of the lace and the eyelets. YARN: Knitpicks Lace Weight ‘Bare Merino Wool’ (880 yards/100 gram hank). This is the undyed version of their ‘Shadow’ Lace Weight yarn, which comes in lovely colors, and 50 g hanks (440 yards/50 gram hank). The scarf I knit used approximately 45 grams of my 100 g hank (this translates to 396 yards, and the scarf is quite long). Cast on 46 stitches using twisted loop cast-on. 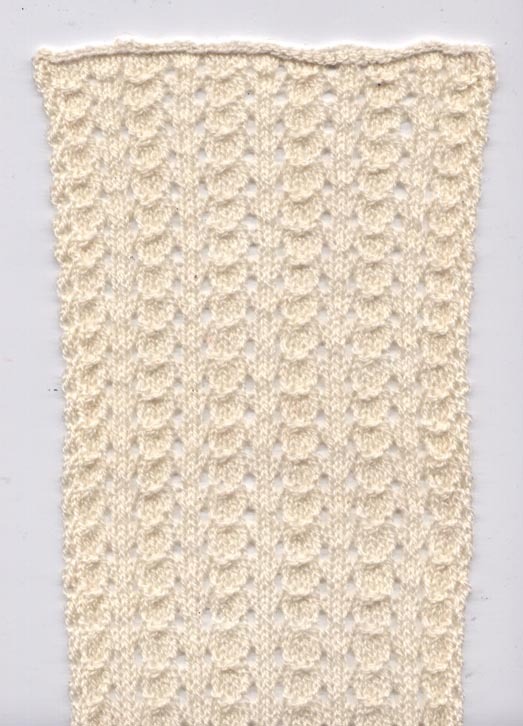 Knit 2 rows in Stockinette Stitch. Work scarf in Shell Lace pattern for 130 repeats, or until desired length. 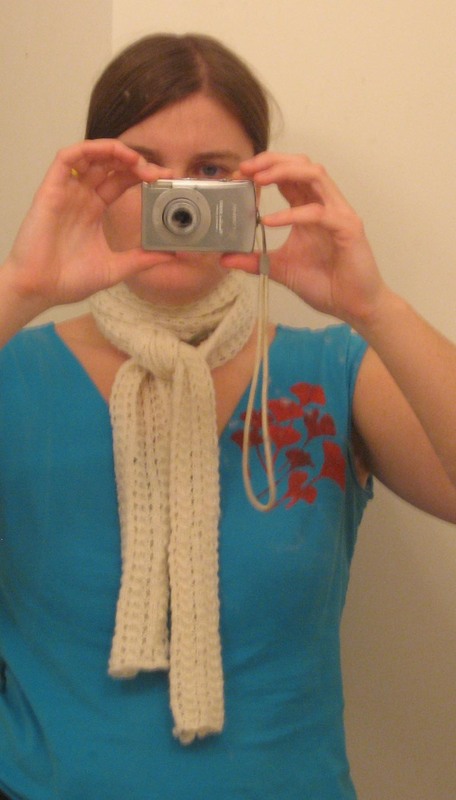 Note: I knit a scarf that is 6 repeats wide, however, if you prefer a narrower, more delicate scarf you could knit 4 or 5 repeats instead.